We had a tricky retrofit installation for an automatic dustpan in our kitchen. Installation included feeding this flexible pipe between floors approximately 10 feet and it worked great. The dustpan isn?t hooked up yet (soon!) but I can already tell it will work perfectly. Thanks for the quick shipment and great product! I am using this product for a dust collection system in my wood shop. The product is 1/3 to cost of the products offered in the woodworker shops. The order was complete on the initial shipment and arrived in a timely manner. Hose cut about half a foot short of the length I ordered. I made it work so no big deal in the end. The product was perfect for the application of mating the central unit to the return ducts. High quality and very well constructed. 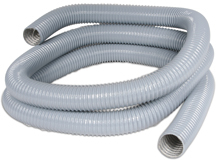 The original flexible hose had all but dis-integrated after 30+ years. Apparently I got the quantity wrong, ordered 3' got 3 inches. Shipping to high. Looks like good quality product. I cut mine to the desired lengths with a hacksaw and then cleaned up the cut with a pair of scissors. I used hose clamps to clamp it to pvc pipe sections glued into pvc fittings. Worked perfectly for our needs- I could only get a 4 foot length at my local retailer, but being able to order an 8 foot length here was a huge help for our Central Vac project! Thanks! Great way to buy flex pipe (by the foot). Very fast shipping. The flexible pipe is a dream come true. Old flex pipe had been destroyed by motor fire, new stuff was correct size and easily routed into the correct position. I appreciate the quick shipment. Needed this hose to replace pipe and an elbow the bozo contractor didn't cement on one end. :-( Had to cut a hole in the ceiling and reach through closely-spaced floor trusses above to even find the problem, but this hose is exactly what was needed. The flexible pipe worked out fine for me where I needed to go around a pipe. The clamps and the vacuum bags I brought were also received just fine. Nice solution for connecting a floor sweeper vac because it enables the installation to be pulled out of the cabinet and repaired. Much better than hard piping for the last few feet. Top quality hose generously measured - more than I ordered by almost 2 feet. easy to use and connect to the flomaster vacuum, saves having to buy several fittings.